The turn of the 18th and 19th centuries in Slovakia was, as across all Europe, a period of the birth of the modern era, influenced mainly by the inheritances and legacies of the English Industrial Revolution and the Great French Revolution. For Slovakia this period particularly meant the need for national self-determination and regional unification. 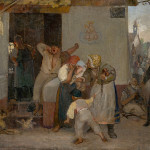 19th Century art in Slovakia can be divided into three relatively compact periods. In the first third of the century, painting activity was concentrated mostly in Eastern Slovakia, where the area of Spiš had a particular importance and tradition. Here worked prominent portraitists and landscape painters who followed the link to European classicism and in their work gradually approached romanticism and realism. Within the ambit of Eastern Slovak painting there is Jozef Čaučík (1780 –1857) in particular. 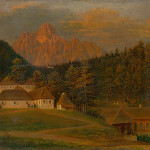 He worked in Levoča and became a leading painting figure in the first half of the 19th century. He influenced the onset of the national, mainly portrait school. In his work he focused on creating the portraits of personalities from the circle of the bourgeois state. Remarkable are also some of the landscaping work on which he worked with a sense of detail. He was among the top influential artists of sacred paintings commissioned by the Evangelical Church. In his effigies there are revived images of the bourgeois class of Spiš in all its diversity and richness. 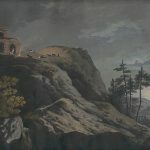 This circle of painters also includes the landscape painter Ján Jakub Műller (1780 – 1828), Ján Rombauer (1782 – 1849), Karol Marko Sr. (1791 – 1860), Karol Tibely (1813 – 1870), and Ignác Klimkovič (1800 – 1853). Around the year 1850 the so-called National School within visual arts and painting in particular was formed. The name is derived from the efforts of former generations of young intellectuals cooperating on national self-determination, rights and building the awareness of Slovaks in the territory of the former multinational Kingdom of Hungary as part of the Austro-Hungarian Empire to achieve its own statehood. Art in the difficult period of the 19th century developed in response to several European centers that provided university education. Even at the end of the 18th century the important Dutch painter Jan Jakub Stunder (1759 –1811) settled in Spiš, whose activities in Slovakia stimulated the development of classicist painting, especially portrait painting, in which more Spiš portraitists were engaged. Ján Rombauer (1782–1849) was a significant portraitist and landscapist in Spiš. His romantic vision of reality led him to a specific position of stylized portraits with a park background. An elegant courtly expression came into his painting after a stay at the Czar’s court in St. Petersburg. Realistic painting in the mid-19th century is associated with the historical process of the national revival, which sought the constitutional secession of Slovakia, but this actually occurred by 1918, with the emergence of an independent Czechoslovak Republic. 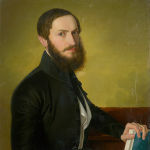 Prominent representatives of the realistic and socially-oriented national school of painting were mostly the figuralists and portraitists Jozef Božetech Klemens (1817 – 1883) and Peter Michal Bohúň (1822 – 1879). Klemens focused on creating portraits of the Slovak and Czech intelligentsia of the 1940s. The painting illustrated the civility, dignity and impaired mental and moral qualities of the subjects. He formed a developmental precursor and important incentive for the formation of the romantic portrait, and also romantic landscape painters in Slovakia. In the paintings of Klemens sacral work dominates in addition to portraiture (the ceiling paintings of the church in Bobrovec, the Twelve Apostles in the presbytery of the church in Partizánska Ľupča, the Stations of the Cross in Pružina, Turzovke and the Monastery pod Znievom, the Holy Trinity, the Crucifixion, the Assumption of the Virgin Mary in Žilina, the Virgin Mary Rosary in Kláštore pod Znievom and in Raková, Bless the Christ in the Evangelical Church in Horná Lehota and Sučany). When creating altarpieces Klemens applied the skills of an exceptional portraitist. Therefore we are mainly talking about figures of saints in terms of imaginative portraits (the altarpieces of St. George in Bobrovec, St. Cyril and Methodius in Dohňany, St. Gálus in Komjatná, St. John of Nepomuk in Turzovka and others). Bohúň’s early work is marked by nationalist romanticism, culminating in the work of Ján Francisci as the captain of Slovak volunteers in the years 1848 – 1949, reflecting the romantic pathos, monumentalization and the mythologizing of the national revival. At the end of his work he reached a deepening realism with power in psychologizing portraits. Karol Ľudovít Libay (1816 – 1888) was among specific and solitary figures of Slovak painting in the second half of the 19th century, who devoted himself particularly to watercolor and drawing techniques. 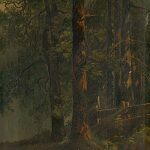 Unlike generations of patriots and nationalists he was a globetrotter and devoted to the genre of landscape, while excelling in minutely detailed descriptiveness and attention to detail. 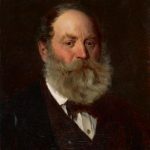 In the last third of the 19th century there was occasionally reflected the impact of arts by Barbizon painters and the Impressionists in the development of painting in Slovakia, the creeping influence of secession art, especially from nearby Vienna, partly Munich and Prague. The brothers Vojtech and František Klimkovič founded a painting school in Košice. Their training was also linked to the painting beginnings of Leopold Horowitz (1838 – 1917), who became a renowned Central European portrait painter, as well as Július Benczúr (1844 – 1920), also a painter of portraits and historical themes from Hungarian history. 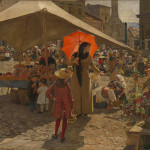 The Slovak painters Dominik Skutecký (1849 – 1921) and Ladislav Mednyánszky (1852 –1919) gained recognition among artists as well as an exceptional Central European response during this period. Only in their painting can you talk about the real overcoming of descriptiveness and academicism painting of the 19th century, and the individual application of the principles of European impressionist paintings. Globetrotter Skutecký emerged in Europe as a successful painter of anecdotal and fashionable genre figurative motifs with a bravely realistic control of landscapes. The Venice motifs are particularly charming. Up until his discontinuation in Slovakia (Banská Bystrica) he matured his bravura painting ideas and expression. The environment of the copper mine fascinated him, where he discovered lighting contrasts induced by the glow of an open fire and work scenes. 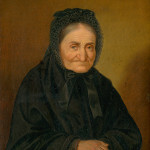 In addition to portraiture he painted small-town and working motifs of coppersmith scenes. His artistic interpretation shifted from realistic to illuminative. Ladislav Mednyánszky is one of the finest representatives of European painting at the turn of the 19th and 20th centuries. He dealt with portraits, socially-rendered figurative composition and landscape painting. He carried himself in a sincere relationship, and admiration for the people of the lowest classes. He represented the deepest philosophically-oriented personality, torn by the inclement turbulent period up to World War I, in which he himself participated. Exceptional artistic talent and mature humanity oriented him on the creation of bravura painting work full of artistic courage, visionary, melancholy and philosophical depth. He regularly returned to his family home in Beckove in Považie and in Strážky in Spiš, where there is a permanent exhibition of his work. His extensive work represents a substantial variant together with a pleinairism and luminism accompanied by elements of symbolism and secession art. For painting in Slovakia, his work embodies the transition to modern art.